So, to celebrate the beginning of the weekend and the weekend as you know is the time for MOAR swatches, I saved a post that I'm quite excited about! I present to you two polishes from the Australian brand Celestial Cosmetics, courtesy of the wonderful Sisi of Color4nails--these polishes should be available on Color4nails website in the next 2 weeks! 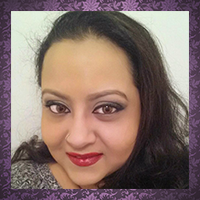 Follow Color4nails on Facebook to keep abreast of the latest stock info! First up, I have for you Mercury Rising--a lovely shimmery silver-white polish with blue microglitter. The application on this was great, no complaints and I used 2 coats for the swatches below, topped with 1 coat of G&G's HK Girl. I love the shimmer that peeks through at certain angles! 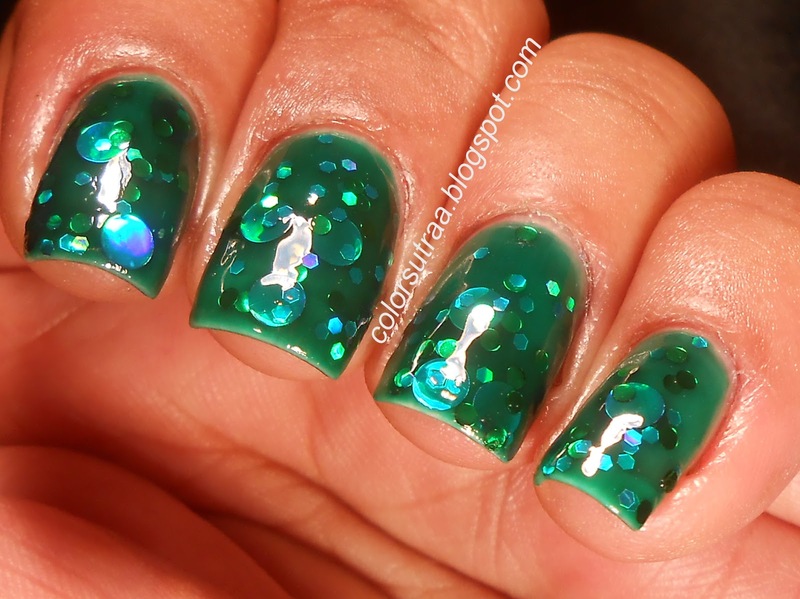 The second polish from this brand I have for you today is Liquid Lawn--a gorgeous emerald green jelly with green hexes and different sizes of green circle glitter, including large holographic green circles!! The application on this was smooth and easy but I did have to fish for the larger circles a bit as they tend to sink to the bottom--I recommend setting the bottle upside down for half an hour before you paint your nails and then a good, vigorous roll between the pams before you get started. 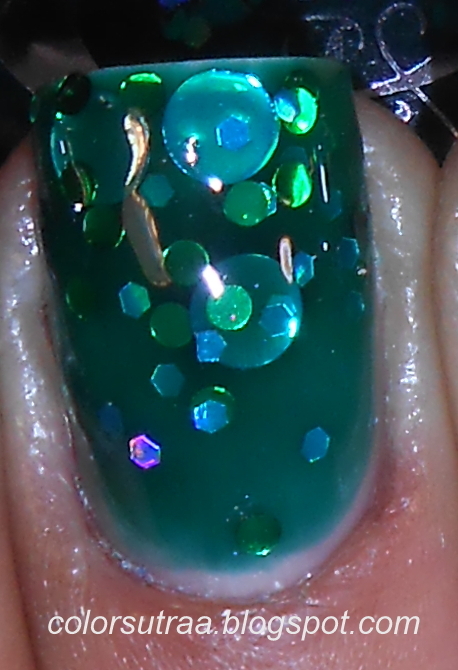 Now, I'm NOT at all a fan of green polish but this polish is absolutely gorgeous! I would say a MUST-HAVE for any green lover! So there you have it, my darlings! Two stunning polishes from Celestial Cosmetics--remember these will be stocked EXCLUSIVELY at Color4nails HERE in about 2 weeks time! And definitely remember to stock up on your G&G HK Girl--Color4nails has that in stock too!